Some SUVs are strictly for the pavement, but the Toyota RAV4 is different, encouraging you to get out and see more. Just because it has the features to go off-roading doesn’t mean it can't handle pavement well: it is one of the few models that can tackle both. Our team wants to show you that the 2019 RAV4 in Milwaukee is a model that can suit the needs of any driver. All it will take is one test drive for you to decide which features you will want to include in your RAV4. The 2.5-liter engine offers 203 horsepower for an exciting ride, and when paired with the Direct Shift eight-speed electronically controlled automatic transmission, you will know that it will be as smooth as possible. Part of the versatility is from the Toyota New Global Architecture (TNGA) that the RAV4 has adopted, bringing a longer and wider wheelbase for a more responsive feeling through Glendale, WI. With the Toyota Safety Sense 2.0 system as standard on every trim of the new Toyota RAV4 near Waukesha, you will be able to stay confident no matter if you are on the highway or if you are off-roading. This system includes Road Sign Assist, Lane Tracing Assist, Pre-Collision System with Pedestrian Detection, and more. While other new SUVs near Franklin force you to pay more for these features, the RAV4 comes ready for you. 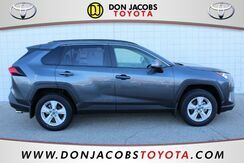 We have helped many drivers in New Berlin see how the RAV4 is a model that you can depend on. With a wide variety of options, we are sure that we can help you get into a 2019 Toyota RAV4 that will be perfect for your lifestyle, all you have to do is visit to get started.